[SatNews] Lockheed Martin [NYSE: LMT] will plan, process and pack a steady supply of cargo for the International Space Station (ISS)—ranging from science hardware to food and the crew’s personal items—under an extension of NASA’s Cargo Mission Contract. Currently, Lockheed Martin maintains more than three million items destined for the station. The team exports and ships about 25,000 pounds of cargo to launch locations around the world annually, including the United States, Russia, Kazakhstan and Japan. The company also processes flight crew equipment, which includes buying, maintaining and preparing items for the ISS crew such as clothing, housekeeping and personal care items, laptop computers and audio-visual equipment. “The Lockheed Martin cargo mission team has responded with flexibility and ingenuity to changes in manifests to keep the space station crew supplied with critical items and support scientific research,” said Art Ibers, Lockheed Martin vice president for Exploration and Mission Support. The one-year extension is valued at $23 million. 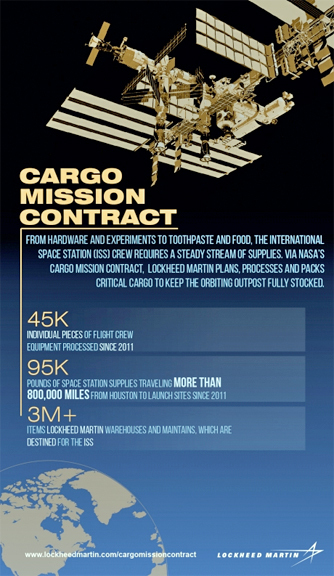 This is the second of four options in the original Cargo Mission Contract awarded in December 2010. Lockheed Martin also supports NASA’s Johnson Space Center in Houston with systems engineering and analysis, control center design, development and operations, life sciences services, human in-the-loop simulations, and a broad range of engineering, science and technical services activities.